The people in the community of Ampilatwatja have been told to boil their drinking water as many – including children – have been struck down with vomiting and diarrhoea, according to a community source. Signs went up in the community yesterday. Ampilatwatja has a population of 350 and is 325 kms north-east of Alice Springs. The source says people in the community have been ill for some three weeks. Some find it hard to comply with the requirement to boil water as they do not have electricity nor big vessels to boil the water in. The Power Water Corporation (PWC) is responsible for the water supply. The Alice Springs News Online has requested comment from PWC and the Health Department. According to the Mayo Clinic’s website Escherichia coli (E. coli) bacteria “normally live in the intestines of healthy people and animals but a few particularly nasty strains can cause severe abdominal cramps, bloody diarrhea and vomiting. “You may be exposed to E. coli from contaminated water or food — especially raw vegetables and undercooked ground beef. “Healthy adults usually recover within a week, but young children and older adults have a greater risk of developing a life-threatening form of kidney failure called hemolytic uremic syndrome,” says the website. PHOTO: Water tower at Ampilatwatja. The Power Water Corporation (PWC) a short while ago said tests today have revealed the Ampilatwatja water supply is now safe to drink. PWC said one of four samples taken on Tuesday showed the presence of E. coli and the community notifications, to boil drinking water, were posted around the community (including school, store, clinic, council office) as a result. A community member said this morning the tank was flushed out and apparently treated with chlorine. PWC says a full statement will be issued shortly, and a Department of Health statement is also expected. Q. How long has Power Water known of the E.coli measurement in the water supply? 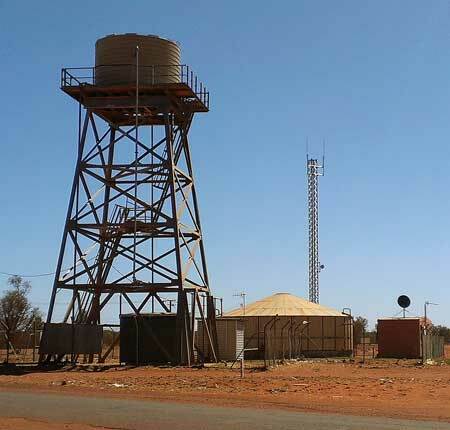 On Wednesday 8 October 2014, Power and Water Corporation was contacted by an independent testing lab in Alice Springs stating that E.coli had been detected in a water sample taken on Tuesday 7 October 2014. The Department of Health was notified. PWC staff on the ground investigated the water disinfection system and determined it was in good working order. As a precautionary measure, the water system was disinfected with chlorine. Further water samples were taken this morning (9 October 2014) and the results will be available by COB Friday 10 October 2014. Of four samples taken, only one detected E.coli with some coliforms in another. The other two samples were clear. It is possible there may have been a sampling error. The Department of Health (DoH) manage all health notifications including Boil Water Alerts. Q. How often does Power Water test the water supply at this community for E.coli levels? Power and Water has a regular testing regime and tests for a range of indicators for water quality. Q. How did E.coli get into the water supply? Escherichia coli (E.coli) is used as an indicator organism. It is used as the primary indicator of faecal contamination of drinking-water supplies, due to its prevalence in the gut of warm-blooded animals. The cause is unknown and PWC has disinfected as a pre-cautionary measure. Q. How long have residents been exposed to the contaminated water? PWC undertake routine testing and E. coli was detected on Wednesday 8 October and action taken immediately on Wednesday 8 October. Q. What should residents do in the meantime while they wait further tests? Will Power Water provide another means for safe drinking water for Ampilawatja, given many residents don’t have access to facilities to boil their water? A DoH Boil Water Alert has not been issued for Ampilawatja and the water system has been disinfected. There is currently no health requirement for residents to boil their water.